Complimentary Cosmetic and Implant Consultation! 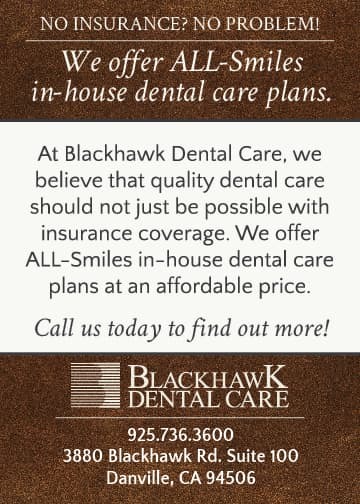 Curious about whether you would benefit from Blackhawk Dental Care’s Cosmetic and Implant Dental Services? Schedule your complimentary consultation with our doctors and have them provide you with a customized treatment plan to get the most out of your oral health! Is your smile’s shine starting to fade? Treat yourself to Blackhawk Dental Care’s in-office whitening treatment! Are you looking to straighten your smile and get the most out of your oral health, but would prefer to do it inconspicuously? Schedule your complimentary consultation with our Invisalign® Certified doctors! Ask us about our in-office membership plan, a cost-effective alternative to dental insurance!